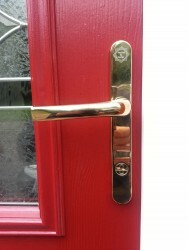 Supplied and fitted brass secured by design pro secure handles to a composite door. The handles have been designed to be tamper proof. Offering a high security option to this front door. To find out more about how you can make your home secure with top-quality window and door locks and handles, please visit our A.L.S. Locksmiths’ website [www.als-locksmiths.com].